Image: Cellphone Tower (Wiki Commons). The study, authored by Professor Enrique A Navarro, concluded that the severity of such symptoms directly correlated to cell tower exposure levels. In other words, the closer a person lives to a cell tower, the greater the severity of their symptoms. This was true regardless of race, income level and other demographics. Cell towers, of course, broadcast and receive electromagnetic switching signals. Human biology — and the brain in particular — relies on electro-biochemical pathways for healthy function. Many scientists have long suspected that chronic exposure to low levels of EMF pollution (electropollution) may interfere with healthy functioning of the brain and body. This latest research adds yet more support to that alarming idea. Electromagnetic hypersensitivity has long been dismissed as non-existent by some doctors and industry-funded scientists. After all, if EMF pollution from cell towers really does harm public health, then the implications are truly massive, both economically and in terms of human suffering. The term electromagnetic hypersensitivity has been recently introduced in discussions attributing symptoms to exposure to EMFs. A review of this topic in 2010 found that 8 of the 10 studies evaluated through PubMed had reported increased prevalence of adverse neurobehavioral symptoms or cancer in populations living at distances < 500 m from [cell phone towers]. Importantly, all these symptoms were recorded in people living near cell phone towers whose broadcast signal strength meets current safety guidelines. As the study author points out, this most likely means current government guidelines on cell phone towers are inadequate to protect the public. Revising such guidelines could have drastic implications for the nationwide telecommunications infrastructure. By the way, people who live fewer than 500 meters from cell phone towers appear to be especially at risk of electromagnetic interference with brain function. Because electropollution strength is determined by the inverse square of the distance, a person who moves twice as close to a cell tower experiences four times the radiation. 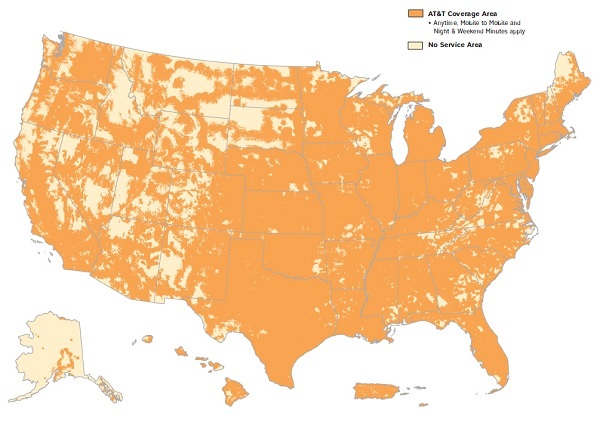 The following map shows AT&T coverage areas in orange. If you live inside an orange area, you are currently exposed to cell tower radiation. People who live within range of two or more cell phone towers experience electropollution from all the towers within a range of 21 miles. This electropollution effect is cumulative. It is not known how many Americans live within 21 miles of at least one cell tower, but given that over half the U.S. population lives in urban areas, it’s safe to assume that at least 150 million — and more likely close to 300 million — Americans are exposed to EMF electropollution from cell towers. Have you noticed how the mass public seems increasingly confused and irritable? A society that once operated with some degree of sanity and politeness has become largely demented and rude. Mathematical abilities are nearly lost across the population, as very few people under the age of 40 can even calculate 15% waiter’s tips at a restaurant. The ability of voters to understand laws, liberties, freedom and even the structure of government is almost entirely lost in nations where cell phone towers are ubiquitous. Given this recent research revealing the negative impact of cell phone radiation of human brain function, it would be incredibly irresponsible to fail to consider how cell tower radiation alters healthy brain function and promotes confusion and irritability. As more scientists look into this issue, we may indeed find that the fall of American civilization is being accelerated by electromagnetic pollution that leads to disastrous cognitive consequences across the population.